Fold card stock into cards. Use solid colored card stock for patterned monsters. For the yarn monster, draw lines with white craft glue directly onto the front of the card. Cut yarn into pieces and place onto glue lines. Use the pattern provided to cut out monster shapes from patterned scrapbook paper. Use a glue stick to attach them to the front of the cards. Add features and embellishments using googly eyes, markers, pom poms, and scrap paper. For the ghost shaped monster I drew two antennae with a marker and glued silver pom poms to the ends. I drew lines on white scrap paper to create the teeth, cut them out and added them with glue stick. I finished him off with a large yellow googly eye. For the shamrock monster I cut teeth and sharp claws from white scrap paper and added them with a glue stick. I traced around everything with a fine point black marker (optional) and drew on eyebrows and mouth. Finished him off with monster googly eyes. For the yarn monster I drew a big bushy eyebrow hovering above his body and added a jumbo sized googly eye. 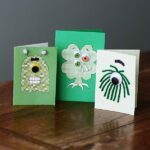 This project for Monster Cards for St. Patrick’s Day was printed from CraftsbyAmanda.com - https://craftsbyamanda.com/monster-cards-st-patricks-day/ and can only be printed for education or personal use.